This foldable 3m x 3m gazebo can be easily assembled in minutes by simply opening out and extending the legs. The gazebo can be folded away into the carry bag with a handle to make carrying and transporting simple. 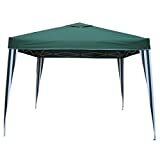 This gazebo tent would be ideal for summer gatherings, BBQs and parties and is suitable for most size gardens.